Thank you to everyone who has followed, liked and read the Alumni Catalyst blog! I have decided to put the blog on hiatus for the time being. I wish you best of luck with your plans to keep your alumni engaged and involved! Most schools' alumni associations will be able to meet, in person, 5-10% of their alumni base in person each year. But, what percentage of your alumni base would say they feel connected to their alma mater? It would be more, most likely. Many alums may only come back to campus every few years, or sporadically attend regional institution events. But that doesn't mean they don't still feel engaged... through the university magazine, by staying connected with friends or visiting their alma mater's website. It is important to remember that large percentage of alums who we will not see on a yearly basis. How can the institutional community be brought to them? How can they still feel like they are interacting with the school? This is where a digital strategy is ever important for an alumni association. 1. Create a content plan for your social media feeds. Content plans can feel daunting and are typically an easy thing to set aside when there are so many other pressing issues to deal with on a daily basis. However, if you can find the time to go through a content planning exercise, what you will find is it will actually reduce stress for you because you won't have to spend time every day searching for a good article or picture to post. Create a plan where you break down the focuses of the posts you will make each week. Make sure to have posts that showcase a number of different areas of your school: student life, professor recognition, athletic achievements and alumni profiles. By breaking down future posts into different areas of the institution, it can help make sure your content feels fresh and that you appeal to a broad audience of your alumni. 2. Weave in your school's mission or unique reason for being. ​Is your school known for its engineering program? Does your institution have a strong service community? Is your president beloved by alumni? Figure out ways to showcase those aspects of your school that stand out. Highlight amazing stories from the engineering department. Take pictures at all of the great service events. Have a weekly video chat with the president. Make sure you provide regular updates on the unique aspects of your institution. 3. Stimulate interaction. This is the hardest thing to do, because interaction is best when it is organic. It is important to discuss, as part of your social media planning, what you can do to encourage more alumni interaction on your social media feeds. What questions can you ask that you know will receive a response? Ask alumni to share stories about their favorite places on campus, their favorite professor, stories about a professor who it about to retire, and memories from student clubs, dorms and traditions. Every post does not have to include a question that needs an answer, but if you weave them into your content plan, you'll find it easier to start getting responses. ​Social media strategy is challenging, but by following the three steps above you'll find that your social media feeds will become more active, engaging and thoughtful! Most alumni and annual giving offices utilize volunteers in some way. There are some programs out there that are best in class, but most schools have their fair share of successes and challenges with alumni volunteering. Perhaps one of the biggest challenges is how can we find those uber alums, the individuals who not only love our school, but are willing and have the time available to help us with attracting more alumni to reunion, or serving as an admissions volunteer or calling up classmates and asking for a gift. 1. Speak with class presidents and vice presidents - When it comes to Reunion, the default choice for a Reunion volunteer is to call on the class president. Sometimes the president would be a great volunteer, but there are also many times when this person is too involved in other activities to give enough time and effort. Sometimes the president isn't actually the networker that one might expect either. However, the class president will know who from their class would be best served in a reunion volunteer role. Schedule a call with him or her as a way to get to know the class better and to do a little recon on who from the class could fit that uber reunion volunteer role best. 2. Search social media - Review your top hashtags on social media or use data from social media vendors you currently work with to determine which alumni are out there who are regularly sharing your information. Pair this with any user open rate data you have from your email system. This alone will not be able to tell you if someone can be a good volunteer but it will give you an idea of how well-connected someone has stayed to your school. 3. Check for involvement at the club level - Which alumni are club leaders? Would they be interested in serving directly with your school in some volunteer capacity? You don't want to cannabalize someone's volunteer time with a club, but many alums are willing to take on multiple volunteer roles. 4. Have a position description available. Being able to provide a short, one page description of what an alum will be expected to do as part of a volunteer role can help set expectations and can help to avoid confusion regarding responsibilities. Position descriptions can ensure that you don't have an alum agreeing to the position but then realizing after the fact that he or she isn't truly up for this type of work. 5. Ask the right questions - When speaking with an alum about volunteering, have a set of questions drawn up that you want to go through. Often times this can help determine if the person you are speaking with will be able to fulfill the responsibilities of the role. 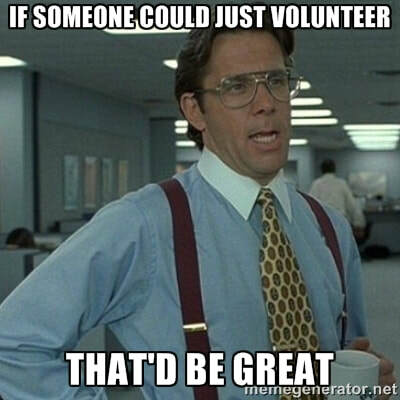 Depending on the volunteer position, you may want to ask things like "What other types of volunteer work do you do? ", "Have you been involved in fundraising initiatives in the past? ", "What do you think about the latest news from the college/university? ", "This volunteer role requires 10 hours of work a month, do you think you can fit that into your schedule?" ​Finding great alumni volunteers can be challenging. Planning and persistence can help ensure that your success rate is high! Much has been made over the past 5 - 10 years about the power of crowdfunding in higher education. 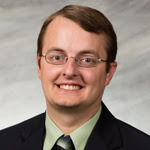 Crowdfunding provides the urgency necessary for higher ed fundraising, it cedes the responsibility of fundraising to concerned constituents - making the ask more personal and heartfelt, and it can provide a unique, short-term platform for restricted gift fundraising at a lower dollar threshhold. All of these things have allowed days of giving and student run crowdfunding campaigns to become immensely popular. Amongst all the advances made due to new technologies available, not much has been said about how some of these same technologies could impact the world of alumni relations. If Uber can revolutionize the cab industry and Air BNB can transform the hotel industry, what can change the world of alumni relations? What product or platform can provide a new way for alumni to interact, to contribute and to share through their relationship with their alma mater? In 2016, we began looking for new ways to reach our alumni. We provided a good range of opportunities already: regional alumni receptions, on campus tailgates, social media feeds, e-communications, and local service opportunities in select cities. However, we wanted to do something more. With the onslaught of new tech out there, there are a number of different ways individuals can share their expertise in ways never before possible. This provided a unique opportunity for us. We knew one of the strengths of our alumni base was our base's willingness to help others. The College's mission is "Ask More of Business, Ask More of Yourself" and we have some great programs for students to participate in while in school. We had also launched a local service opportunity for alumni in DC, Chicago and South Bend that allowed teams of alumni to serve as pro bono consultants to local nonprofits. This program was running well, but we didn't have a way to scale it nationally. We knew our alumni enjoyed using their business skills to benefit others through a connection set up by Mendoza, but was there a technology available that would allow us to take this type of program online? Enter crowdsourcing. 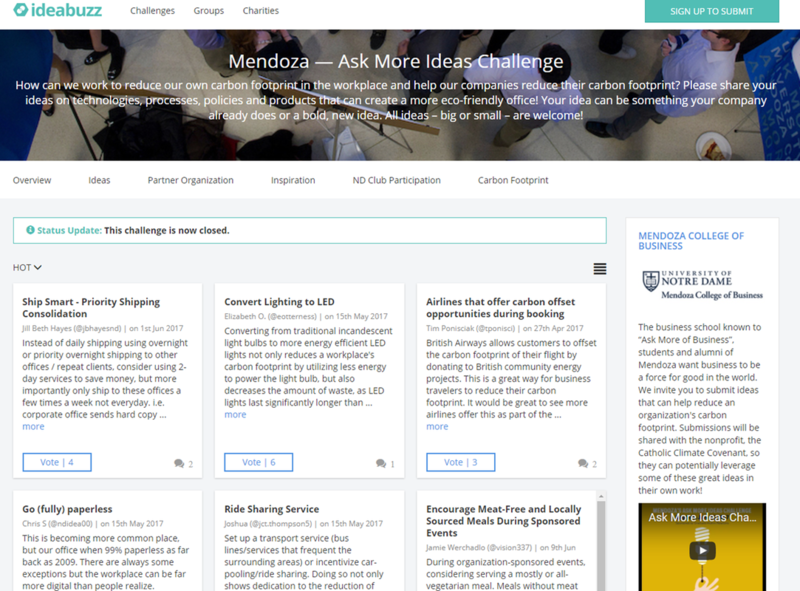 Crowdsourcing ideas... as a force for good. Crowdsourcing has been around for a little while now. There are crowdsourcing sites like Kickstarter and Indiegogo that help individuals crowdsource funds. This type of crowdsourcing migrated into higher ed with companies like Scalefunder and the proliferation of days of giving. But there are other types of crowdsourcing tactics as well. IDEO, a famous design consulting firm, has been running idea sharing challenges on its social impact site, OpenIdeo, for a few years now. The idea is that to solve some of the world's biggest challenges, the best way to do this is to utilize the wisdom of crowds. While you could get 5-10 experts into one room to discuss how to get more clean water to India, the best way to find the most effective solutions is actually to get as many opinions as possible, from people with expertise in a variety of different areas, and then to refine those ideas with the power of that same group of people. OpenIdeo, along with other campaigns, provided us with the inspiration necessary for our new alumni relations campaign. We wanted to provide an online platform to allow our alumni to share their ideas for solving a specific societal challenge. We wanted to pose a question to our alumni that they would be uniquely qualified to answer, and we wanted to allow our alumni to vote and comment on ideas suggested by their counterparts. What do our alumni think? While we had what we thought was going to be a great way to engage our alumni. We wanted to be sure of it. We surveyed our alumni and asked them what they thought of a number of different service opportunities and types of service organizations to help. The idea sharing suggestion received high marks, so we were more reasonably assured that this could work. We then set about determining a topic. We wanted something that was targeted toward experienced business people, but also something that would be a broad enough topic that an alum could contribute regardless of whether their background was in marketing, operations, accounting, finance or anything else. Ultimately, we suggested a topic centered around the environment and how businesspeople can help to reduce the carbon footprint of their workplaces. 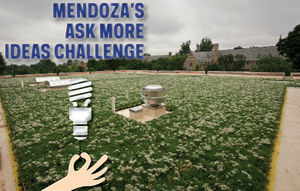 We set the challenge to be one month long, from May 15 to June 15, and called it the Mendoza Ask More Ideas Challenge. Internal partnerships: We worked with many different offices on campus to help spread our word: The Alumni Association, Development, the Office of Sustainability and our MBA student New Impact chapter. All of these groups helped spread the word about our challenge to their constituents as well. Outside partnership: In order for the suggestions made as part of the campaign to truly have a significant impact, we wanted the suggestions to benefit a group beyond our alumni base. We partnered with a nonprofit, the Catholic Climate Covenant, who also promoted the campaign to their constituents and helped us review ideas. Local touch: While we wanted this challenge to be conducted online, we also saw the value of doing in-person events as well, as this would provide a new form of engagement event, something very different than a typical networking reception. We hosted a dinner for our alumni at a local farm-to-table restaurant with table hosts at each table to facilitate conversations around the carbon footprint topic. The Challenge was quite the task. Some aspects of our plan exceeded expectations, while others fell flat. In the end, we finished with 64 ideas submitted. Our goal had been 100, but ultimately we were satisfied with our final tally. So what worked? Local dinner: The dinner we hosted sold out and we received very high marks from our attendees. Many alums commented that it was nice to interact with fellow alumni in a way in which they feel like they are contributing, not just networking. Internal partnership: It was great to have other departments on campus willing to share our message and help us reach a different constituency base. Social media: We didn't get quite as much activity as we had hoped to see. The question itself: This is perhaps the most difficult part of running an idea challenge. The question has to be perfect in that it draws people in, but will also elicit a wide variety of answers. In retrospect, our question may have not been audacious or out-of-the-box enough to really inspire 100 ideas. Our goal is to have a different challenge question posed each year, leveraging the talents of our alumni to help a different group of individuals or part of society in need. What do you think of the idea? Could your school launch something similar? This post was first published on Evertrue's blog. BuzzFeed has flipped the journalism world on its head. From humorous top-10 lists to high-level news reporting, the tech company excels on both ends of the spectrum—and has done a great job of drawing in a younger audience because of it. Visitors might come for the quizzes, but they stay for the breaking news and investigative reporting. There’s a good lesson here for higher-ed alumni relations and communications teams. By attracting alumni to your site with fun content, they may be more likely to see important information like fundraising appeals, reunion details, or volunteer opportunities. Here are just a few examples of institutions that have begun to experiment with the BuzzFeed model to reach young alumni and students. 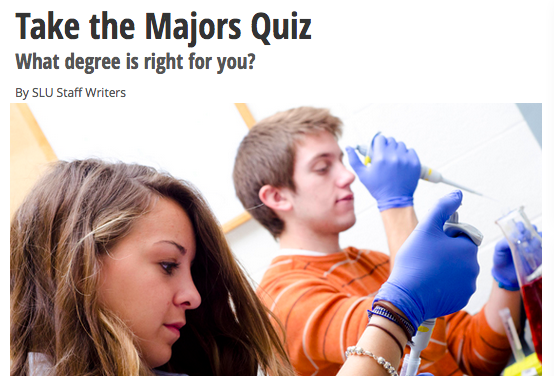 ​While this example is admissions-focused, alumni relations and fundraising professionals should take note: Saint Louis University (SLU) attracts potential applicants to their site by offering quizzes that are highly relevant to incoming college students (e.g., “What degree is right for you?” and “What student organization is right for you?”). The “would you rather” scenarios presented in the quizzes—similar to what you’d see in a DISC assessment—make the University feel personable and approachable. Because the information provided in the quizzes could apply to any college experience, SLU’s admissions site has the potential to bring in traffic from Google searches like “roommate advice” or “what should I major in?” They’ve already cleared the first hurdle when it comes to reaching prospective students. 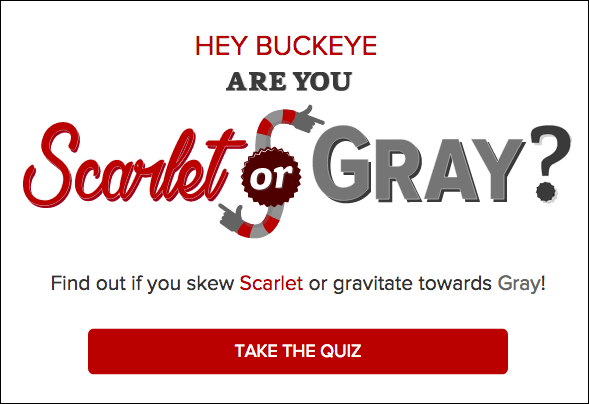 ​Last year, the Ohio State University (OSU) ran a creative alumni engagement campaign supported by an interactive quiz called “Hey Buckeye: Are You Scarlet or Gray?” The 10-question quiz asks questions about university traditions, an alum’s former dorm room, the alumni magazine, and much more. Interestingly, since the campaign is geared towards alumni, OSU places two calls-to-action at the end of the quiz: make a gift to an OSU area you’re passionate about (which ties back nicely to the quiz), and/or share your results on Facebook or Twitter. 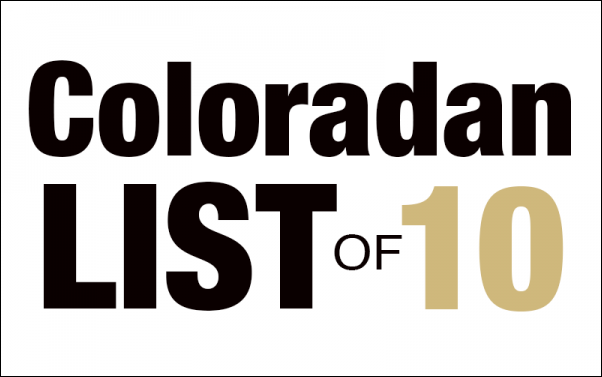 Not only are these lists quick and easy to share on social media, but they also serve as a gateway to the more in-depth articles that CU publishes in its online magazine. Pinterest is under-utilized by universities and colleges. It’s a great space to catalogue different aspects of your alumni base’s passion for their alma mater, including pictures, school-inspired recipes, tailgating suggestions, and decoration ideas. 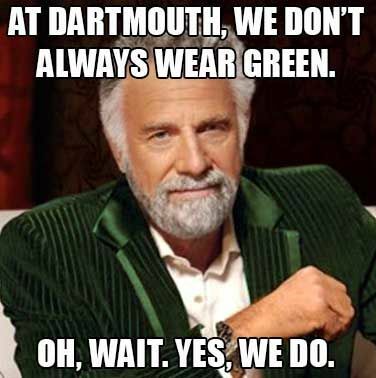 Dartmouth runs some great Pinterest boards that serve to rekindle alumni’s appetite for all-things Big Green. For example, they pin memes related to life at and after Dartmouth so that alumni can easily share them on social media. ​There are even schools that publish directly to BuzzFeed! The BuzzFeed Community section of the site allows users to create and post original content, which Marquette has been doing over the last few years. 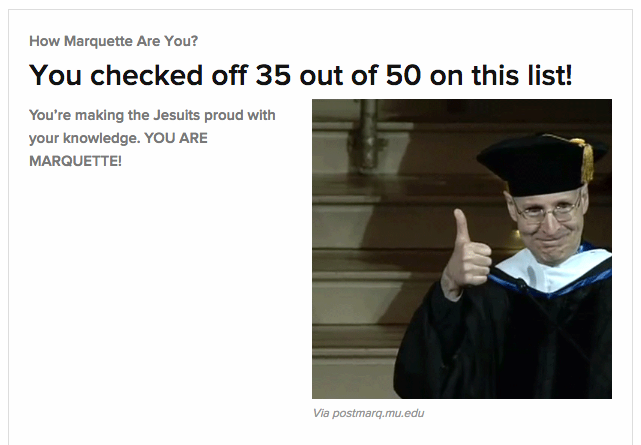 For example, Marquette has published a quiz to find out which Marquette legend you are; a list of 13 Marquette alumni who have made it big; and a one-question quiz called “How Marquette Are You?” The site allows you to quickly share your results on social media, helping alumni and students showcase their Marquette pride in a viral way. What lists can we create that will be quick, easy, and entertaining for alumni to consume? Can we enlist the help of alumni for creating these lists? How can we create engaging, short quizzes for alumni using our own technology? What type of call-to-action should we display at the end of a quiz? BuzzFeed successfully reports on breaking news while including individuals’ reactions to the news (usually from social media). How can we do the same when we communicate institutional news? Can we include reactions from alumni on Facebook and Twitter? Publishing both serious and fun content can be a challenging act to balance, especially for a higher-ed institution. But BuzzFeed isn’t the only one who does it well—get inspired by the above examples and give it a try at your own institution. With the Star Wars resurgence still going strong within the world of pop culture, I thought I would post again about the importance of storytelling for fundraising, alumni relations and admissions. Storytelling helps us better relate to a person’s struggles, and helps illustrate how someone can get through those struggles with some help. And, it is through this help that an individual receives in most stories that allows storytelling to be so powerful for fundraising or alumni relations. ​Last year, I wrote about some examples in higher ed where institutions have been able to replicate Joseph Campbell’s “The Hero’s Journey”, through video work. 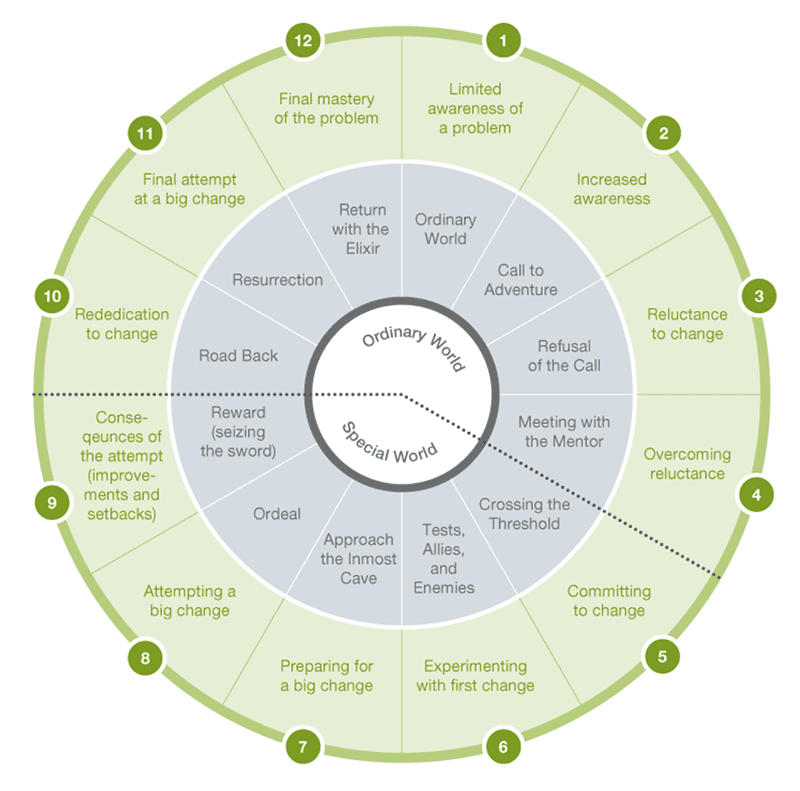 The hero’s journey describes a common storytelling arc used in many myths and, in modern times, the Star Wars movies. Nancy Duarte does a great job showcasing the up and down pattern of the arc in her book “Resonate”. This time around I wanted to showcase two institutional videos that have many of the stages of the hero’s journey, and similar to “Resonate”, I wanted to show when the peaks and valleys in the stories occur. Below is a graphic showcasing all of the steps in the hero’s journey, and then examples of how the University of Michigan and The College School have videos that follow similar arcs. Now, not every video will have the all of the steps from the hero’s journey, and you will notice that with these two videos, but they share very similar themes. ​The University of Michigan's video "An Unlikely Partnership"
This video tells the story of a Muslim student at UM who leads a team of student volunteers on a service trip in Guatemala. This video has a couple of key elements in it from Joseph Campbell’s hero’s journey. The Ordinary World/Limited Awareness of the Problem (0:05 into the video) – The beginning of the video features a voiceover from an alum stating his thoughts on the students who would be helping him as volunteers on a water sanitization project. He states his initial assumptions about the students perhaps not treating this project too seriously. The Call to Adventure/Increased Awareness (0:18 into the video)– The alum then also expresses why he thinks this project may be challenging for this particular student leader. Refusal of the Call/Reluctance to Change (0:48) – The student leader discusses her apprehension with certain parts of the project. Crossing the Threshhold/Committing to Change (2:16) – The student team leader discusses the acceptance she feels from the local children, when she expected them to be reticent towards her. Tests, Allies and Enemies/Experimenting With First Change (3:03) – The alum discusses how big of a role daily prayer plays in their community, and is hopeful the student leader will be ok with that. Approach the inmost cave/Preparing for a Big Change (3:20) – The student leader discusses how you must learn to work with people who may be very different than you in order to achieve anything. Reward (seizing the sword)/Consequences of the Attempt (3:44) – The village fell in love with the students who were working on the project. Road back/Rededication to Change (4:25) – The student expresses her understanding of the value of what alums are doing. Return with the elixir/Final Mastery of the Problem (4:50) – The student leader explains how she now understands how great it is to work with alumni and later explains why she loves working with people who are different than her. This video is unique it that it is telling one story from two different points of view, but the viewer can still feel drawn in by the use of storytelling techniques and great editing. The College School is a pre-K to eigth grade school whose mission is to "explore the world through authentic experiences, empowering students to engage deeply and be ready for what is next." The school places a large emphasis on experiential learning and reflection. One way the school looks to do this is through giving students the chance to produce videos. And, the school had a need for a studio to really enhance the students' production experience. Here is the video breakdown through the lens of Campbell's Hero's Journey. ​Ordinary World/Limited Awareness of the Problem (0:17 into the video) – The Assistant Director of the College School explains past technical challenges for students at the school but how the students are able to use their own creative ingenuity to still make great video and audio pieces. Call to Adventure/Increased Awareness (0:43) – One of the teachers discusses the value of providing a recording studio for the students and what a difference it would make for the students. Crossing the Threshhold/Committing to Change (2:40) – Faculty members visit recording studios to see how it would work at their school. Tests, Allies and Enemies/Experimenting With First Change (2:50) – The College School discovers that a recording studio will be able to fit into one of their buildings. Approach the inmost cave/Preparing for a Big Change (3:50) – Teacher talks about how the one big thing that is missing from a lot of the student’s creations is a good recording studio. Reward (seizing the sword)/Consequences of the Attempt (4:44) – One of the School’s students talks about the pride she had in a recent video that was produced by some of her fellow students. Return with the elixir/Final Mastery of the Problem (6:18) – Staff members discuss the impact a previous fundraising attempt had on the school, and the immediate impact of a donation. Next time you are going to develop a fundraising or alumni relations video, keep the “Hero’s Journey”, and some of our most treasured myths and movies, in mind and see how you can incorporate various steps to tell a compelling fundraising or engagement story. This post originally published on the Evertrue blog. So, your advancement office has a great social media plan. You’re pushing out quality content, and your alumni are sharing and re-tweeting your posts using hashtags. If these are the types of questions you grapple with every day, you may want to look into using social media walls. There are plenty of content curation tools available that can aggregate your best social media posts and display them in one place—whether on your website or on the big screen at an event. Below are some of the ways that a social media wall can add value to your alumni engagement efforts, plus a few questions to ask yourself before you launch one for your institution. Content curation has been a tried-and-true tactic in the athletics world for a while now, and for good reason—the ability to display social media content on a Jumbotron makes TV timeouts and halftime shows that much more fun and engaging. Plus, because fans want to get featured on the big screen, they’re much more likely to use the hashtag and post about the event from their social media accounts in the first place. Why not apply this type of technology to our alumni events? You don’t need a Jumbotron or fancy equipment to make it work; a few TV screens or a projector will do. 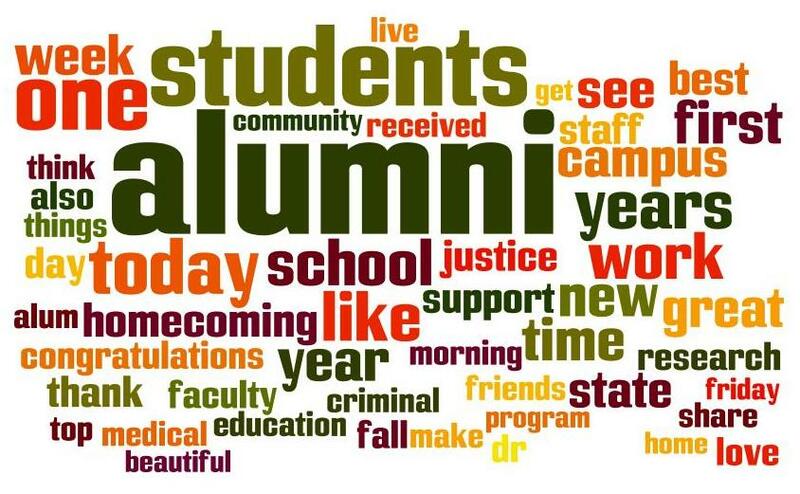 Just think about the impact of aggregating all of the amazing thoughts your alumni are sharing on social media. They’re excited to be at your event—so showcase that excitement! Whether it’s reunion or a campaign kickoff, a live social media screen can build more buzz around the event and put a much-deserved spotlight on your most engaged alumni. Many institutions have also started placing social media walls on their websites (and microsites) to support giving days and other campus events. Just like with content curation for events, these walls can capture and display live social media activity from Facebook, Twitter, Instagram, and more. Let’s look at a few ways that schools are using social media walls on their websites. This year, the University of Washington created a social wall focused on graduation, encouraging seniors and their families and friends to post pictures of the weekend using the UW graduation hashtag. For those who couldn’t be there in person, the wall helped capture and spread the excitement of the event. 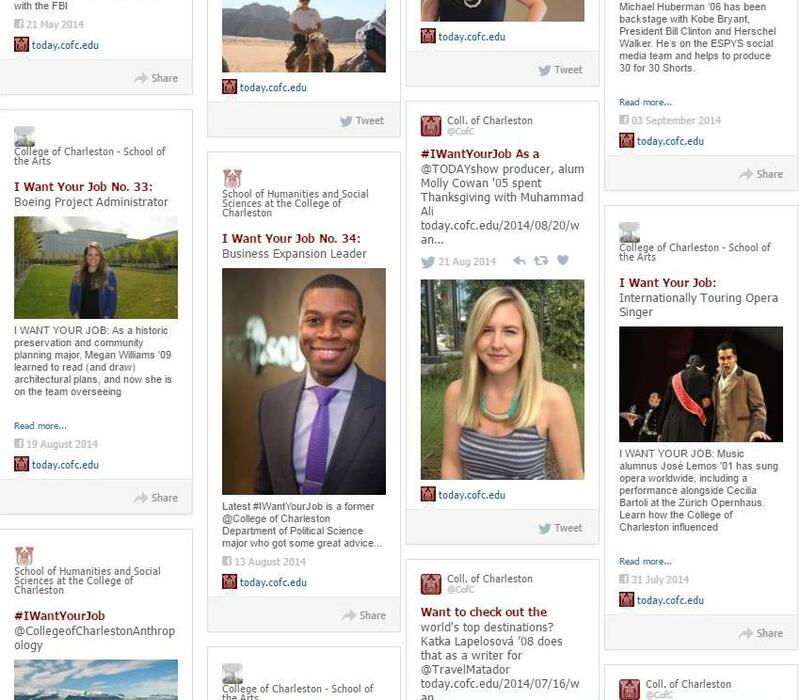 The College of Charleston has a number of different feeds on its “social stream,” including one called “I Want Your Job” that highlights alumni who have interesting or unique careers. 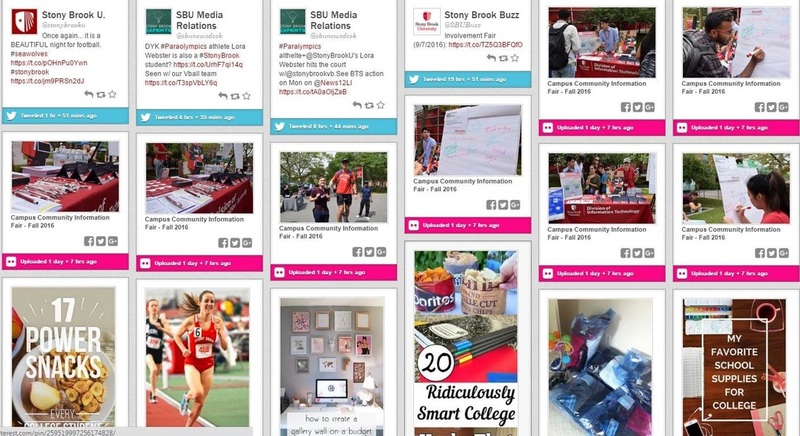 Stony Brook University’s social media wall pulls in content from a variety of university-run social media platforms (even Flickr!) to keep website visitors in touch with their latest and greatest content. 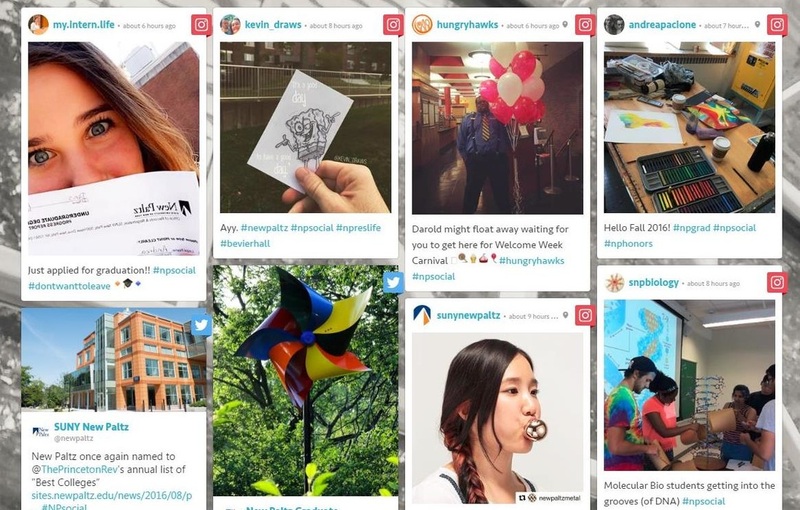 On SUNY New Paltz’s “social media hub,” they do a fantastic job of sourcing content from both student and university-run social feeds to show off what’s happening across campus. 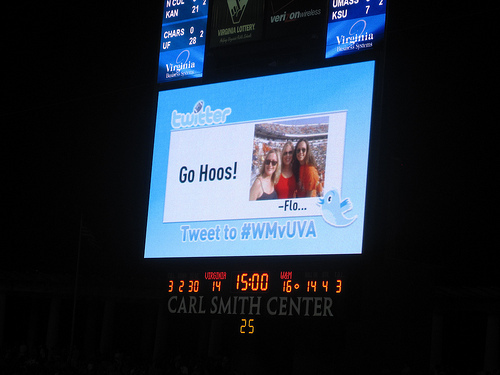 Thinking about launching your school's first social media wall? Do you want to showcase your school’s official social media content, or do you want to pull in content from alumni and friends of the school through hashtags?Showcasing your administration’s social media feeds is simple to set up and more cost effective, while collecting content via hashtags may require an additional investment in promoting certain hashtags amongst your followers. Where are you going to place your social wall? To get the most out of your social wall, you’ll want to put it on a webpage that gets solid traffic. For example, if alumni only visit your development page when they want to make a gift, that may not be the best place for your social wall. Rather, put it on a page that you know gets a lot of alumni traction. Do you have enough activity to warrant implementing a social wall? If you’re going to launch a social wall that pulls content from student and alumni accounts, then it’s imperative to have the infrastructure and strategies in place to stimulate more content. Most higher ed institutions cannot take a “sit back and watch” approach. You need to cultivate social media activity through social media ambassador programs, signage on campus, student interns, and cleverly crafted marketing campaigns. Once you’ve answered these questions and you are confident in your social media presence, your next step should be to research social media wall tools and determine how they might support your office’s engagement and fundraising goals. 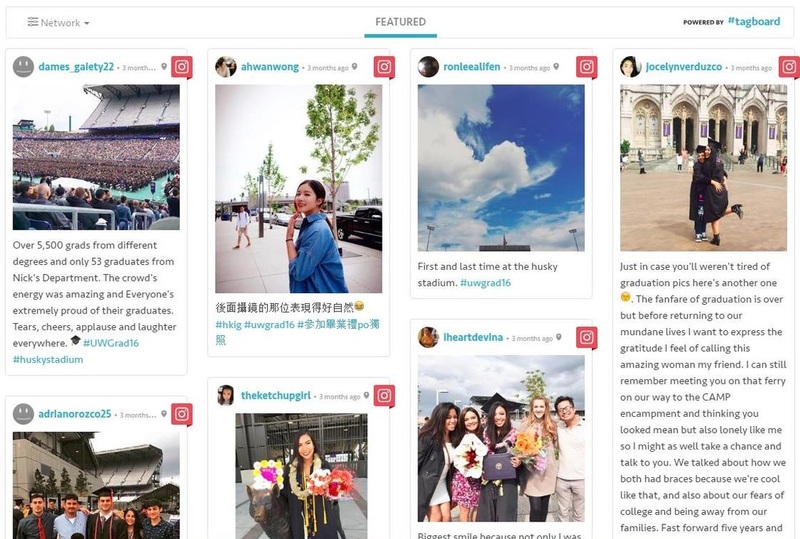 From boosting online engagement to bringing non-social media users into the conversation, content curation via social walls could be a powerful way to amplify your institution’s brand and mission. Summer tends to be a slower time for interesting news to post to our alumni bases… no athletics events, no student achievements, less faculty activity. But, come August, there is a new influx of great activity and events, worthy of liking, posting and sharing. Of course, first is freshmen orientation/move-in/welcome weekend. Many schools are now going above and beyond in capturing the excitement of this weekend. Here are some examples from across the country. Share with us what your alumni association or development department did to commemorate the big weekend! ​Loyola welcomes its new students and has some great pictures on their website showcasing the process. ​Dartmouth took a fun approach to welcoming its freshmen with a video focused on giving students advice on what to pack for "first year trips" which is part of Dartmouth's orientation. ​Fordham created a very unique look at what it must be like for first year students. had a series of videos that played off the fact that for those who are not local, going to Fordham is not just about going to a new school, but also about the experience of living in New York City. The school created videos where they asked other New Yorkers, not necessarily associated with Fordham, what advice they would give to those living in the Big Apple for the first time. Duke highlighted its convocation with some great photos paired with powerful quotes from the event. And, the school also made a video featuring the convocation paired with an infographic on the new class of 2020. College of Charleston had perhaps the most coordinated and deep campaign surrounding their students’ return. There were multiple campaigns to create engaging content and to motivate action on the part of students and alumni. #Cougarwelcome was a day of giving campaign tied to the return of students. The campaign featured photos and video, and tied in the pineapple, a universal symbol of welcome and one that is prevalent in the south. Alumni, staff and students were encouraged to write a message of advice to students on a printed-out pineapple, and used the hashtag #PassThePineapple to encourage more interaction online. The College also had two other campaigns that created some great social content for them. In one campaign, using the hashtag #ThinkBig, the school set up a giant chalkboard outside and encouraged students to write what one thing they would like to accomplish before they graduate. The school was then able to make a very engaging video out of the students writing their notes. 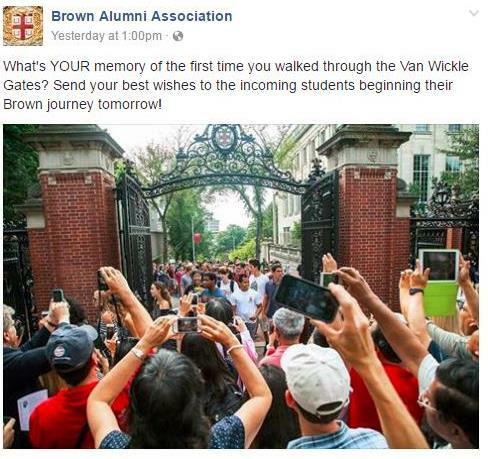 Separately, the school also took around a large picture frame branded with the school’s mark and the date of the first day of classes and simply took photos of students, staff and professors, and posted the album onto Facebook. Here is a great photo from Brown capturing the excitement around a local campus tradition, and showcasing how technology is affecting that tradition nowadays, with all of the cameras out! The “Class of 2020” group photo has become an iconic rite of passage at many schools as you can see above from the University of New England and Gonzaga University. What examples do you have of great welcome weekend campaigns? Share them with us! There are only a few events that really unite the broad majority of us together in a shared experience. The Super Bowl would be one, the World Cup is another in many parts of the world, and the Oscars may be a third to a smaller extent. However, when the Olympics roll around, Summer or Winter, for sixteen days there really is something for colleagues, friends and family to gather and talk about. Given this communal experience, it is also a brand manager's dream. 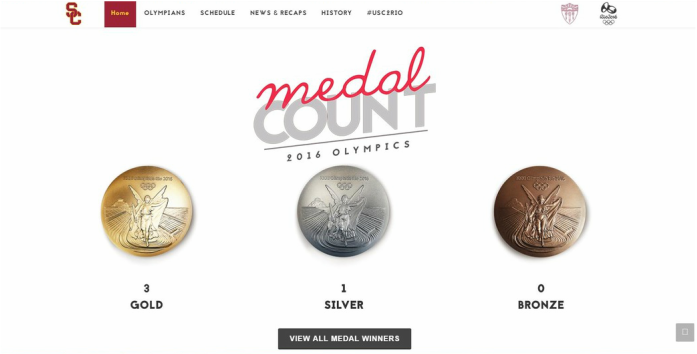 The Olympic sponsors find a number of ways to leverage the Olympics through commercials, giveaways and display advertising. 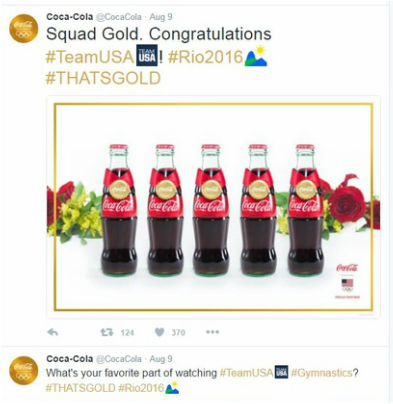 Coca Cola and P&G have been Olympic sponsors for a number of years. 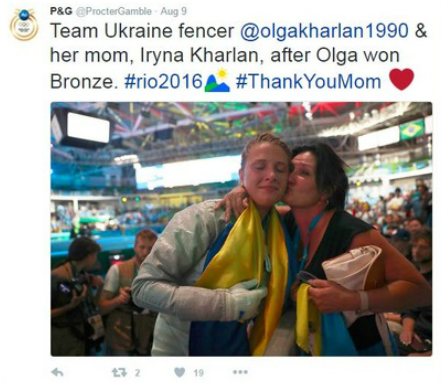 With the prevalence of social media, the brands are finding new ways to leverage their Olympic partnerships. As part of the Olympics, many fans are looking for particular athletes to root for. Hometown athletes become a particularly popular group to rally around. Another group that people have an affinity for are alumni and students from their alma mater. With the Summer Olympics taking place while most schools are not in session, this is a great opportunity to create positive social media content during a time when good content may be hard to come by. 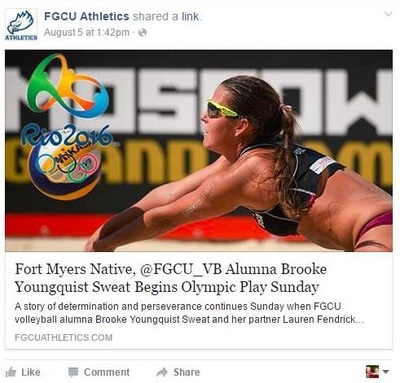 As discussed in my recent white paper, the most popular topic for Facebook posts aimed at alumni are athletics related posts, and the most popular tones to use when posting to alumni social media accounts are fun, celebratory and inspirational tones. 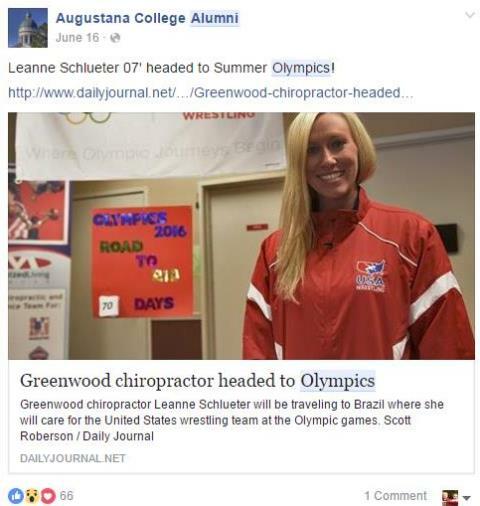 When you think about creating a post about an alum or a student who may be participating in the Olympics, this topic really lends itself to creating posts that are fun, celebratory AND inspirational! Many schools have done a great job of providing updates on how their students and alumni are doing in the Olympics! Take a look at some of the samples below. 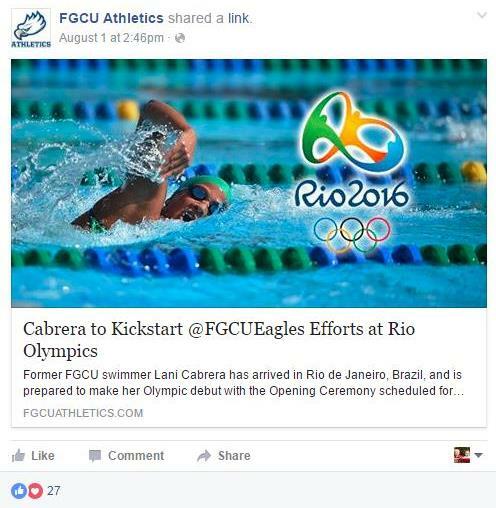 FGCU does a great job of highlighting each of their Olympians individually on their Facebook page! 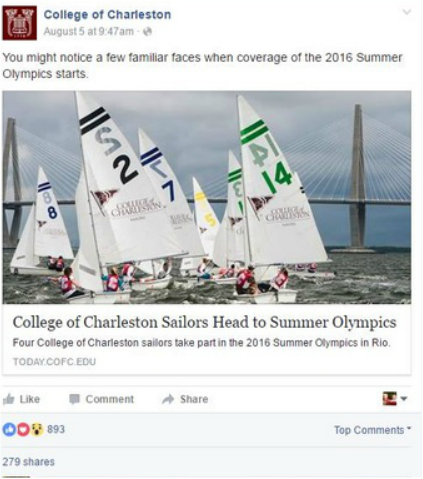 College of Charleston has a great sailing program and is proud to be so well represented at the Olympics! 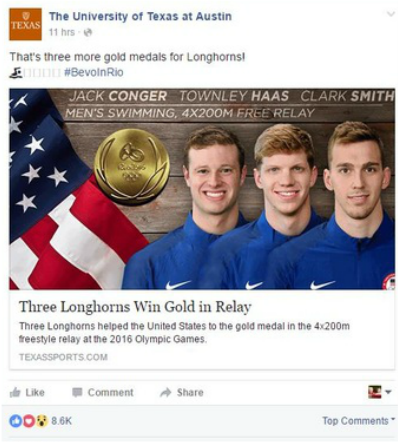 University of Texas has already had a few gold medalists in Rio, and they are keeping up daily with updates! 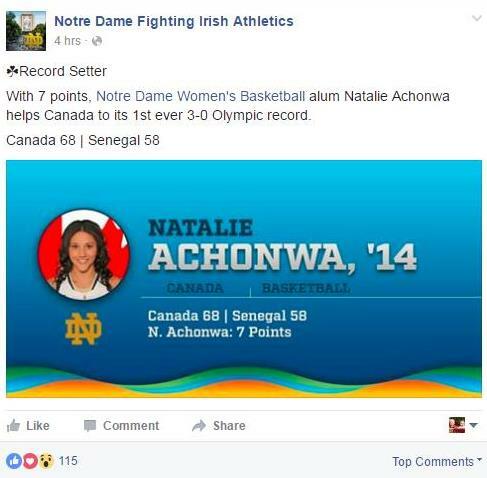 Schools can post about US Olympians but also their students and alumni who are Olympians for other countries, like Notre Dame does here! No Olympian from your school this year? No worries, you can always highlight students or alumni who are involved in other ways, like Augustana and California State University, Los Angeles! 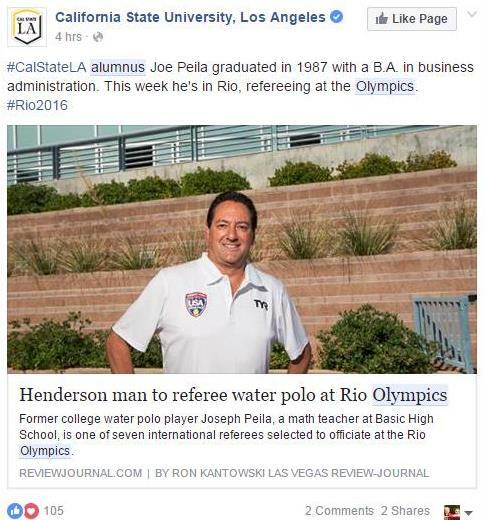 USC is one of the biggest producers of Olympians and the school takes its support of those Olympians very seriously. 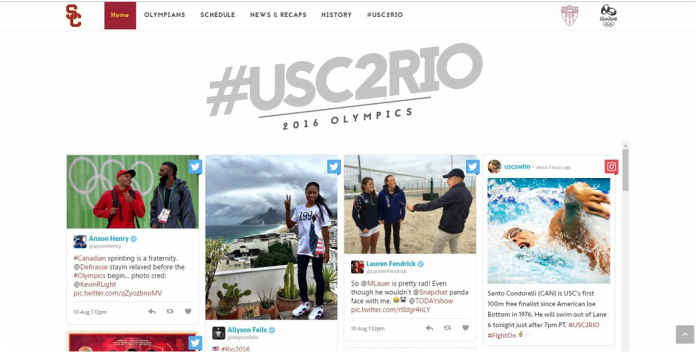 The Trojans have created a whole microsite for following all of their Olympians, their medal counts and their social feeds. How has your school utilized Olympic fever to engage your alumni base? Go for the gold! In 2015, I partnered with Academic Impressions on a survey focused on best practices in social media management for higher ed institutions. We created a great white paper with lots of insights about how often, where, and what to post on social media when connecting with alumni. One interesting part of the research was seeing what words appeared most often in survey respondents' top Facebook posts. Here is a word cloud (courtesy of wordle.net) featuring the 50 most commonly used words from respondents' top Facebook posts from the prior three months. To read the white paper, visit the Academic Impressions website.